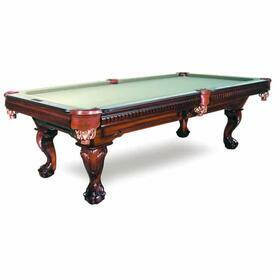 Medium Wood Finish Pool Tables for Sale with Free Shipping Nationwide from Family Leisure! 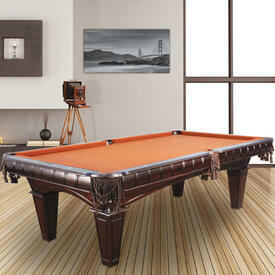 Sick and tired of the boring old pool table look? Consider these with medium wood finishes from Family Leisure! Each offers beautiful brown hues and amber colors, perfect for home designers or homeowners searching to match a table with existing furniture. Or do you have an empty space you need to fill? Build your game room furniture collection around one of these models; we promise to provide the very best brands, with the best materials and the best construction techniques. In fact, we challenge anyone to find a better pool table than the ones offered by Family Leisure, with brands such as Brunswick, Leisure Select, American Heritage, Plank and Hide and more. Along with quality products comes quality installation, for if one is installed wrong the slate can be damaged. And that brings us to the slate: we only carry slate pool tables, with no particle board or other shady materials. That means you provide the smoothest possible gameplay for your guests and neighborhood pool sharks.